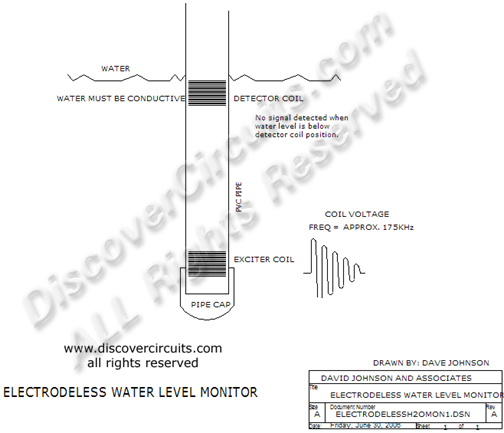 Circuit: Electrodeless Water Level Monitor __ Circuit designed by David A. Johnson, P.E. This system operates much like a classic float switch but without any moving parts. The illustration shows how a system using two copper coils sealed inside a plastic pipe, can detect the level of water outside the pipe. Whenever the water level is lower than the upper coil, no signal is coupled between the coils. Once calibrated, this technique might also work on the outside of a plastic water tank.